Board games are, for me, mostly, an element of a loaf. Friends are around, we have board games, test and see what people are into and then we go for it. Sometimes my board games go into a bag and travel with me to my parents’ place and they don’t get played and that’s okay. Usually ‘board games’ mean playing a few different games in one spot. Very few games I own really qualify as the kind of thing it’s worth making into any kind of event. I have one that can, though. And it’s one of the best games of its type to get you into playing board games. 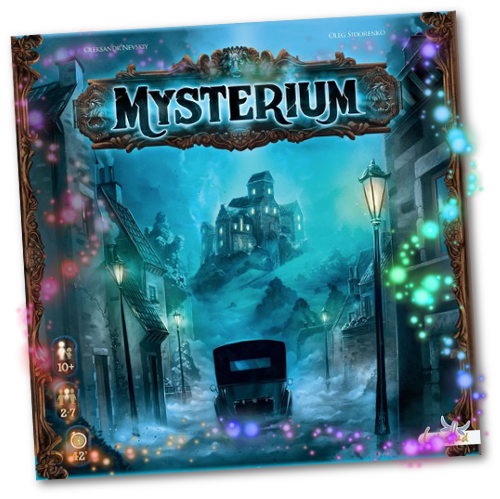 Mysterium is a mystery-solving cooperative board game where the players are trying to solve a murder. The twist to it is that one of the players is playing the murder victim, and rather than detectives who might have to do something with evidence, the other players are psychic investigators attempting to divine some information from visions they get from the ghost. The ghost has a set of clues they have to give to each player, and if all the players correctly reconstruct the events of the final day of the ghost, they can then be guided by the ghost to identify which of the suspects is the murderer. Oh and the ghost can’t talk. The only way the ghost can communicate with the players is to hand them cards. Players can ask the ghost if they’ve guessed right with their clues, but the ghost can’t point or nudge or wink or express dismay or joy – the ghost basically is a baptist. They have to sit behind their screen with nothing but the three little nasty crows they get that can sit on the screen, and look at the cards in their hand, and the information they’re trying to communicate to each player, and doing it all in dead silence. This is one of the most beautifully horrible experiences of the game: You are the ghost, you have the answer, and you need to communicate the answer to people, who from your perspective are either being asked to do the impossible, or are complete idiots avoiding the most obvious use of your cards. The game is lusciously made, which is an important part of why I feel it serves as a gateway game. You don’t have to ask people to handle fiddly small things or worry about them flicking or folding or crimping things. Instead, the play happens around these big (mostly) pieces of cardboard that are used to separate areas of play, so you can ignore what’s outside the area that matters to you. Things can handle being bumped and knocked, there’s no chance you ruin the game state by bumping the table, and the art direction is (mostly) absolutely wonderful. In my own design I talk about the idea of making indulgent games, and this game, this game is absolutely flipping indulgent. The cards are oversized so you can really pick them up and look at them, and that’s good, because the information on them is pretty much completely inscrutable and you’re going to be trying desperately to work out what some weird ghost thinks you’ll see on the card that resembles a donut somehow. When you’re playing Mysterium, you’re not trying to work out a dozen different systems, you don’t need to remember everything yourself, the whole thing is cooked down to one simple puzzle: What the hell is this person trying to tell me? Nobody is adding pressure to your experience, nobody is trying to complicate your life, the whole thing is just this single challenging puzzle, and as you play, you get more and more chances to succeed at it. Part of what gives Mysterium is hook is that it reminds people of another board game they might have played. It’s a bit like Cluedo, so people can grasp that basic idea (trying to solve a mystery) but then it’s nothing like Cluedo, so there’s no contest, there’s no in-fighting and the puzzle is a lot more immediately graspable and a bit less exclusionary pad stuff. The reason I think this game is perfect for both this spooky month but also as a gateway, is because more than any other board games of its ilk, this is a game you can make an event out of. Set up the atmosphere, send out some invites, maybe prepare a nice meal and then when everyone’s all feeling good and settled in, break out the cardboard and put on some spooky music. You’re not here to frighten one another, but you are here to get inquisitively nerdy in a luminous space where you’re all pretending you’re mystics. And you’ll laugh or you’ll gnash your teeth and you’ll get weird visions or really creepy visions and they’ll all come together in this bit of theatre. If you have Mysterium, or you want to play Mysterium, my advice? Don’t treat it like Heading to Josie’s for Board Games.